This swiftly released live recording is an important social document, one which makes widely available a thoroughly enjoyable piano recital given by Peter Jacobs, famous champion of British music. Pieces by composers living the West Country, in their 20s to 70s, are interspersed with Preludes by the Gloucester-born Ivor Gurney. The notes tell a fascinating story of lives in music and the formation of a composers' alliance in the area (one of twelve similar groups in UK, would you guess? – "composing is a lonely occupation"). Most Severnside composers are, or have been, engaged in music professionally. This inaugural piano recitalof the Composers' Alliance's was delayed 'because of unsuccessful attempts to get it into a concert series somewhere'; shame upon those who refused to become involved, difficulties that can surely be echoed in many cities. The music is nearly all 'accessible contemporary', without any of it simplistic or minimal. Richard Barnard's Irish folk tune 'hidden between layers of melody and pulse' is the most radical piece. Geoffrey Self's Sonatina, written for a clavichord that he'd built in the '70s, is unashamedly derivative, 'what used to be called "light music"'. Susan Coppard, who'd long 'doubled as a professional accordion player and Town Clerk of Bradford on Avon' has a pleasant piece composed at Canford Summer School upon 'the most outlandish mode she could devise'. The well-filled CD finishes with two movements of Raymond Warren's sonata, its Monody a fine example of a fascinating genre. Do buy this admirable CD to explore a commendable UK composing stream, instead of loading your shelves with yet more standard repertoire. Well recorded and carefully documented. It would be good to hear from similar organisations which must exist in USA and elsewhere? 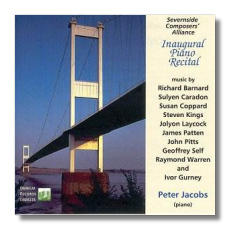 Let us know and contact Severnside Composers' Alliance.